The WDC made a submission to the Department of Tourism, Transport and Sport on the Consultation on Review of Future Capacity Needs at Ireland’s State Airports, December 2018. Some of the key points noted are outlined below. International air access is particularly important for an island economy and for connecting geographically remote regions such as the Western Region. 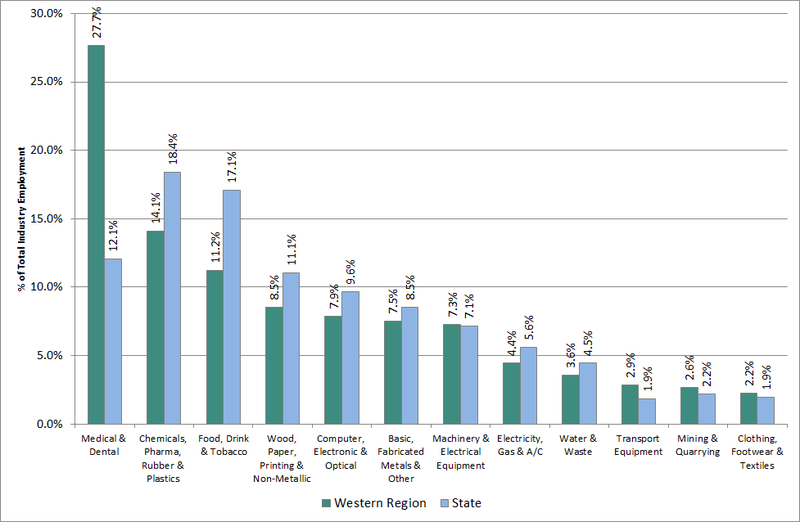 Without efficient air access, companies in the Region are placed at a competitive disadvantage to companies elsewhere. Infrastructure is a necessary condition for regional development and lagging regions need to have a similar quality of infrastructure as is available in more successful regions so that they can compete on a more level playing field. There are two airports, Shannon and Ireland West Airport Knock, which are located in the Western Region and offer a range of international air services. An EU report measuring potential accessibility by air (using an index where EU 27 = 100), found that Dublin was the only region within Ireland above the EU average, measuring 135. The Border region (60.2), West region (66.5) and Mid-West region (80.6) all recorded accessibility scores considerably below the EU average. 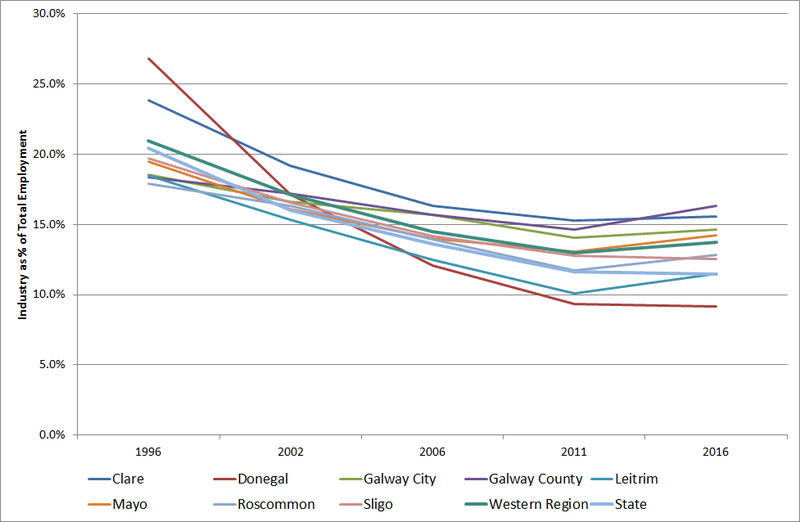 Since this analysis there has been a reduction in air services to the regional airports through the reduction of PSO services which would suggest a lower accessibility score for the Northern and Western regions than that measured in 2009. Nationally, the airports of Dublin, Cork and Shannon are the most important international access points. 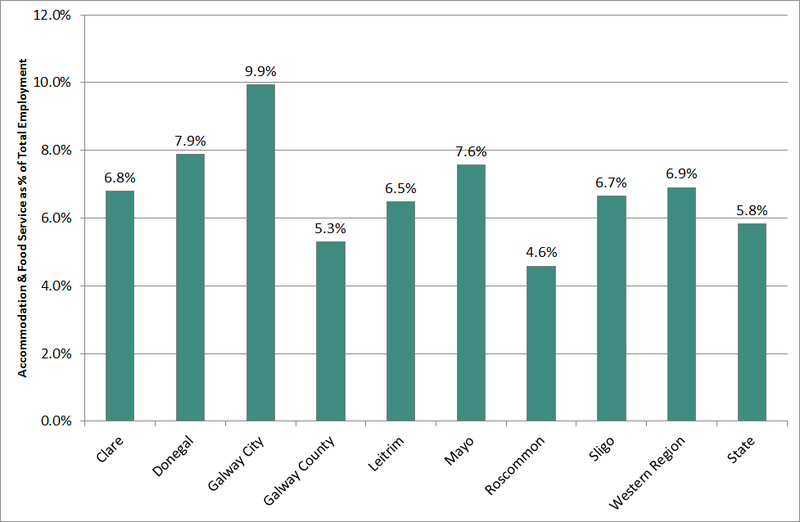 Unlike much of the country, most of counties Mayo, Sligo, Leitrim, Donegal and part of Roscommon and Galway have a greater than two hour drive-time to these airports. 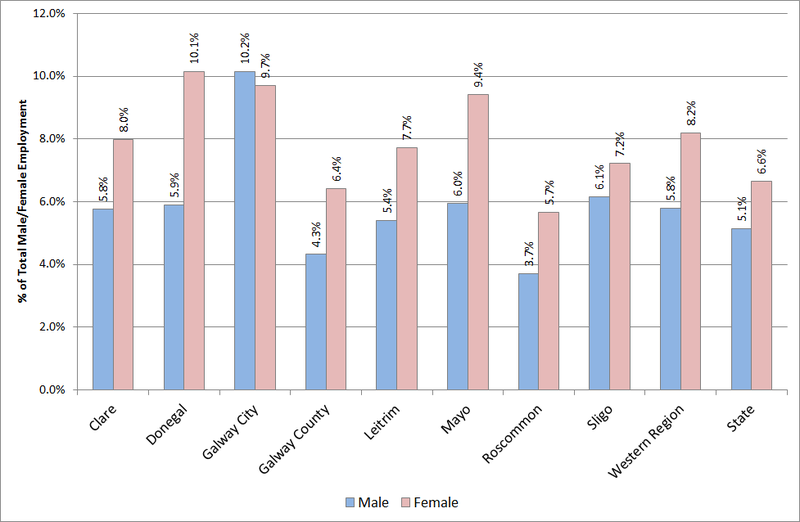 These centres are not adequately served by the three larger airports and Ireland West Airport Knock as the only international airport in the Northern and Western (NWRA) region, serves this catchment. The National Planning Framework (NPF) published in February 2018, is a planning framework to guide development and investment to 2040. 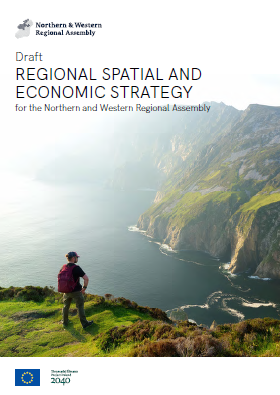 Regional Spatial and Economic Strategies (RSES) are currently being prepared and are to give more detail at a regional level as to where growth should occur. A key element in the NPF vision is set out on page 11. We need to manage more balanced growth … because at the moment Dublin, and to a lesser extent the wider Eastern and Midland area, has witnessed an overconcentration of population, homes and jobs. 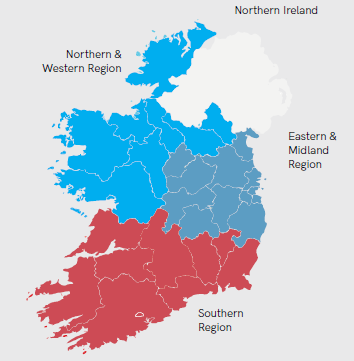 We cannot let this continue unchecked and so our aim is to see a roughly 50:50 distribution of growth between the Eastern and Midland region, and the Southern and Northern and Western regions, with 75% of the growth to be outside of Dublin and its suburbs. In order to ensure the NPF can succeed, departmental and State and Semi-State Agency expenditure decisions and allocations, including the National Investment Plan need to be fully aligned with the spatial priorities outlined in the NPF and RSES. 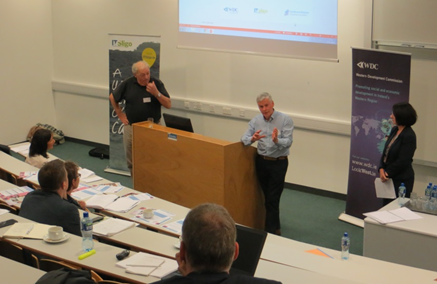 The National Aviation Policy predated the publication and consideration of Ireland 2040, both the National Planning Framework and the Regional Spatial and Economic Strategies. The national aviation policy can be seen to unduly reinforce the dominance of the larger airports (Dublin in particular). Now that the NPF is Government Policy, the National Aviation Policy should be reviewed and reassessed in light of the overarching objectives of the NPF. Even aside from the NPF and RSES, Irish Aviation policy should ensure that policy on air access should be linked to and consistent with tourism and enterprise policy objectives. National aviation policy also needs to fully recognise the international transport function Ireland West Airport Knock provides, ensuring direct international air services to a region much of which is not in the catchment of the other international airports, Dublin, Cork and Shannon. The focus of investment and ever greater expansion in this Review is at Dublin Airport despite the spare capacity at the other three main airports and the ability of these airports to serve their catchments and help drive further development in their regions. The current focus on Dublin Airport only serves the ‘business as usual’ scenario and militates against each of the other airports fulfilling the role envisaged of them and delivering better regional balance. 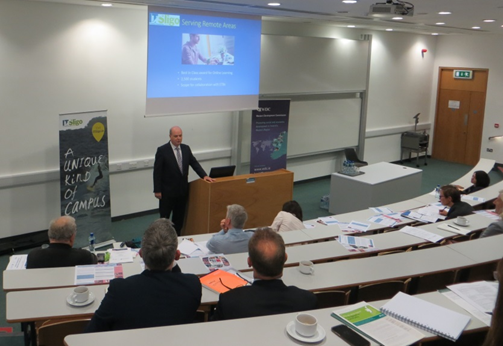 Exports: In late 2018, the Irish Exporters Association (IEA), in its policy paper titled, ‘Building a transport infrastructure that fosters Irish exports to the world’, noted that Ireland’s regions form an important counterbalance to Dublin’s economic strength. Further growth, however, is stalled by limited accessibility to high-class transportation infrastructure. 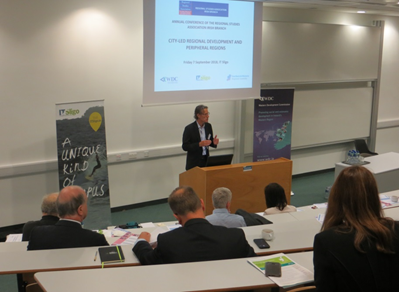 Addressing connectivity in Ireland’s West, in particular, should be a strategic priority to support economic growth and regional competitiveness… The IEA specifically cited the increasing dominance of Dublin airport as an issue. The Costs of Congestion: The Department of Transport, Tourism and Sport has undertaken research estimating the costs of congestion in the Greater Dublin Area (July 2017). Further growth at Dublin Airport will only exacerbate this. The report addresses ‘Options for making best use of existing infrastructure’ but focuses on Dublin Airport (section 5.1.1, pages 105).The WDC believes the best use of existing infrastructure would be by promoting further traffic at Shannon and Cork and the regional airports such as Ireland West Airport Knock. This was the explicit policy position of Government as set out in the National Aviation Policy. The increasing dominance of Dublin Airport in terms of national market share is likely to result in stranded asset issues and increasing spare capacity at the other international airports, Shannon, Cork and Ireland West Airport Knock. The WDC submission also identifies Future Capacity Needs at Ireland West Airport Knock and the value of wider economic impacts for example in the Tourism sector. The Submission also identifies policy supports which can help support increased passenger growth and an increased share of passengers at Ireland West Airport Knock and at Shannon Airport. 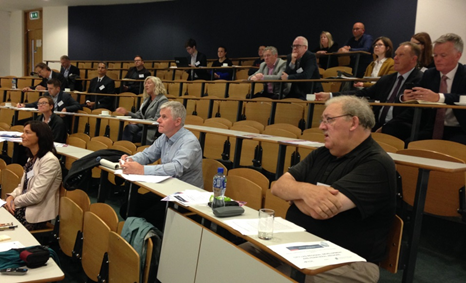 These include route support, route development and airport enterprise promotion. Donegal airport provides services to and from Dublin and Glasgow. 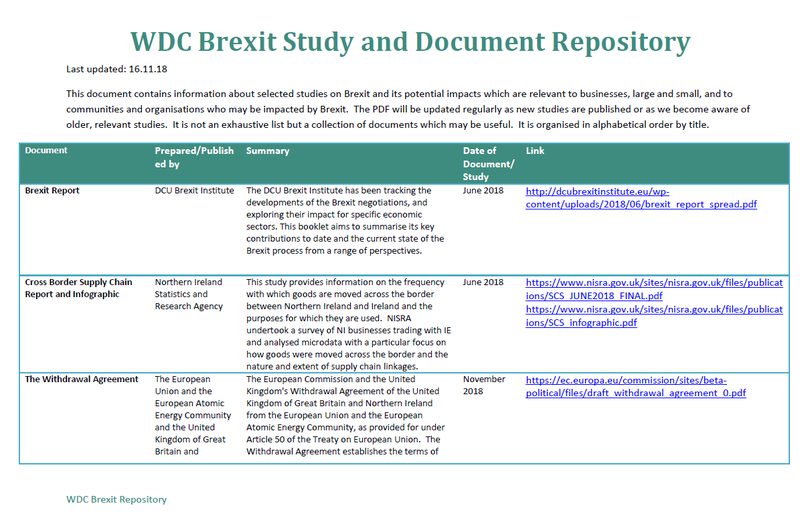 Given current discussion of Brexit and the form it may take, today is probably a good day to let you know about the WDC Brexit Repository. As I noted last year there has been much discussion of Brexit and what it will mean for Ireland, for businesses here, for different sectors, and for social and cultural interactions. The discussion was then (October 2017), and is now, of course, taking place in the context of multiple unknowns. Nothing can be said definitively about Brexit and how it will impact on the region and communities most affected by the border. Some of the issues were considered in this post and in this presentation (PDF 1.2MB). Despite the lack of information and lack of certainty, it is still important to consider possible implications and to look at data that could give us a better understanding of what might occur and what policy might be needed to mitigate or address the issues that could arise from Brexit. The WDC has, therefore, put together a ‘Brexit repository’ which is a PDF document (1MB) containing brief summaries and links to selected Brexit studies and documents on Brexit and its potential impacts which are relevant to businesses, large and small, and to communities and organisations which may be impacted by Brexit. The PDF will be updated quarterly as new studies are published or as we become aware of older, relevant studies. It is not an exhaustive list but a collection of documents which may be useful. If you have any documents or studies which you think should be added please get in touch. And perhaps by Friday 29th March 2019 the form of Brexit and its implications will finally have become clear.